This is where I started first, the end wall. 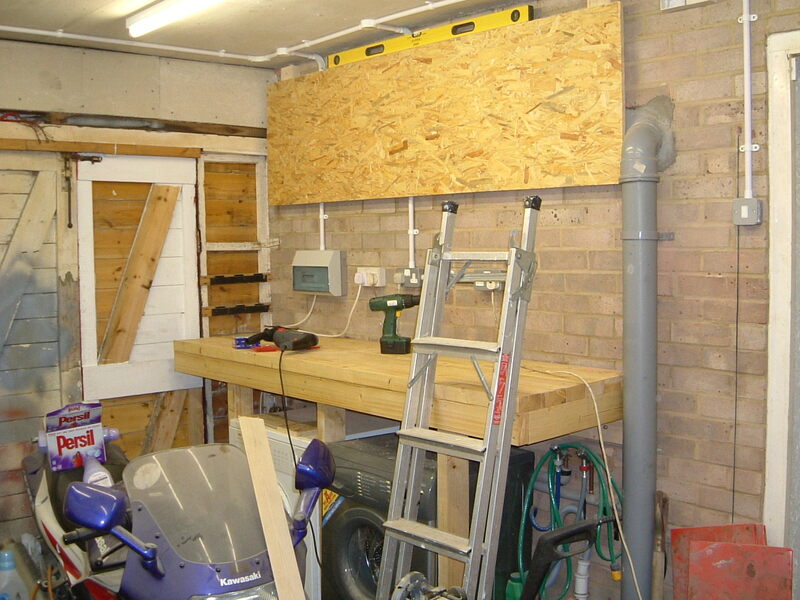 The garage is 17' x 10' (5.1m x 3.0m), and a bench was required to fit the full 10'. There's a door at the end, but this has not been used for 17 years so I'm just going to build in front of it. 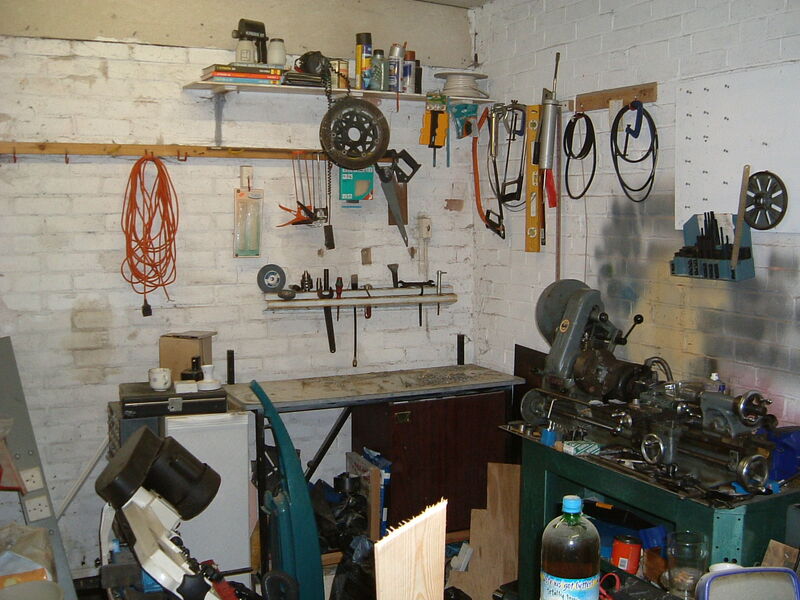 A slight clearout to make room, and the work can commence with a rail to hang the bench from. 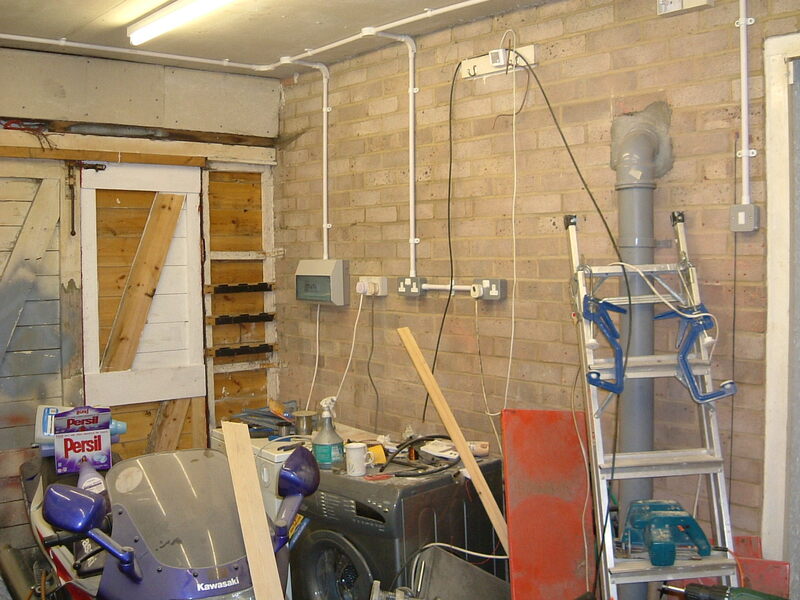 M10 bolts will hold the wood to the brickwork. 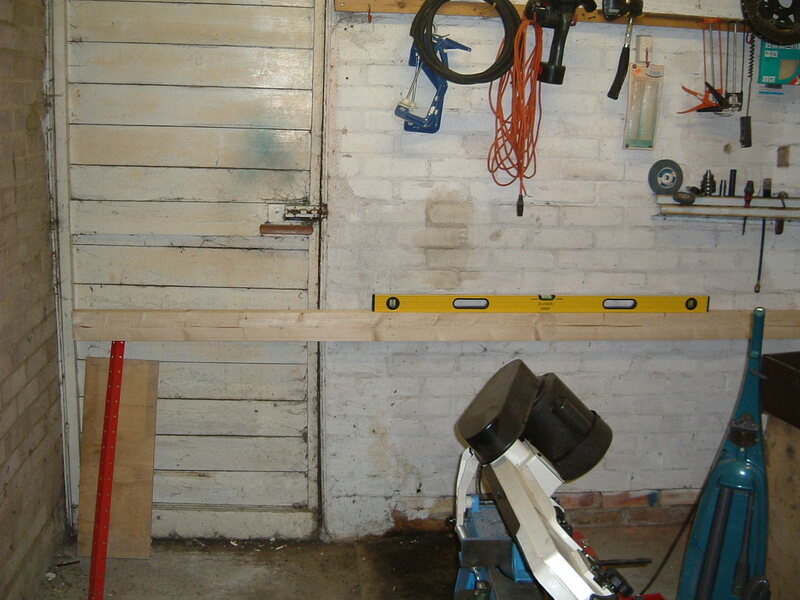 Some offcuts of floor joist from a building job are used to make the legs. 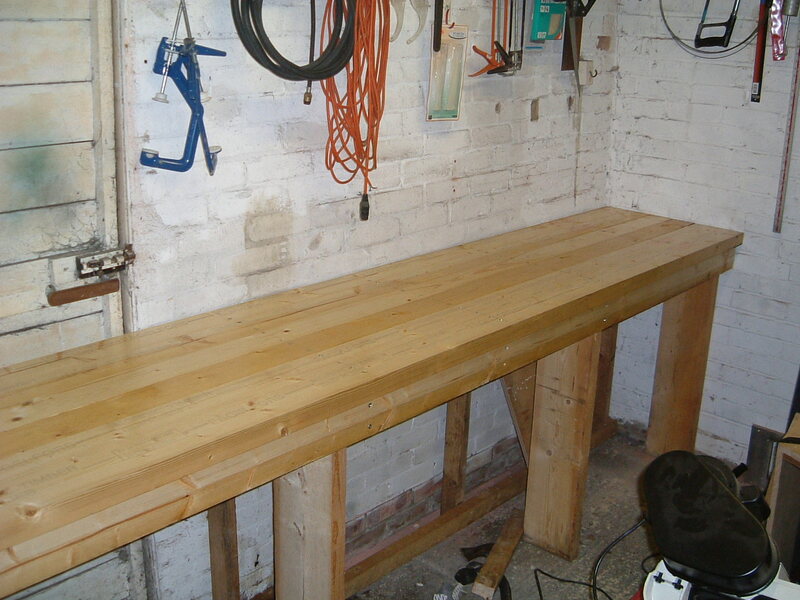 17-Aug-2003: It now looks like a bench! 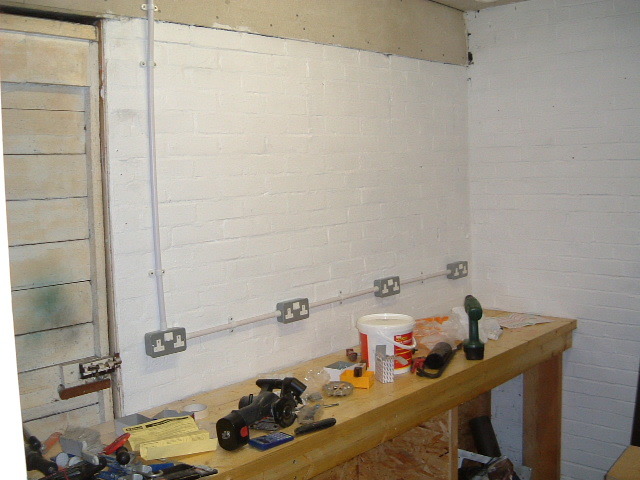 24-Aug-2003: The painting starts, along with the first of the new electrical outlets. A new consumer box, twenty extra outlets, and new fluorescent lights will be added. This all looks a lot tidier that the first picture above. 25-Aug-2003: Electrical mayhem. This is the left hand wall on which the new consumer box is placed. 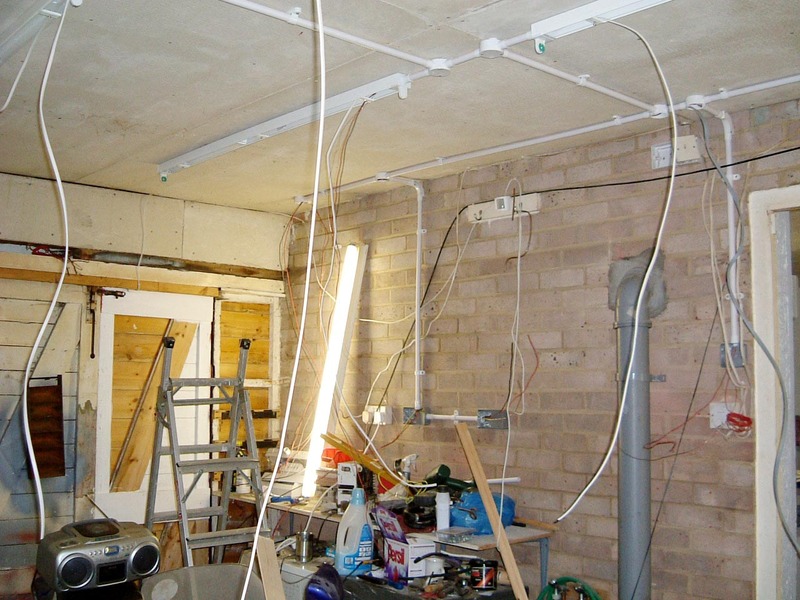 This was probably the worst part of the job as the working lights had to come down so the new lights could go up. 29-Aug-2003: Nearly done, just need some cupboard doors. All the wiring and lighting is done so at least I have good light to work by and power wherever it's needed. 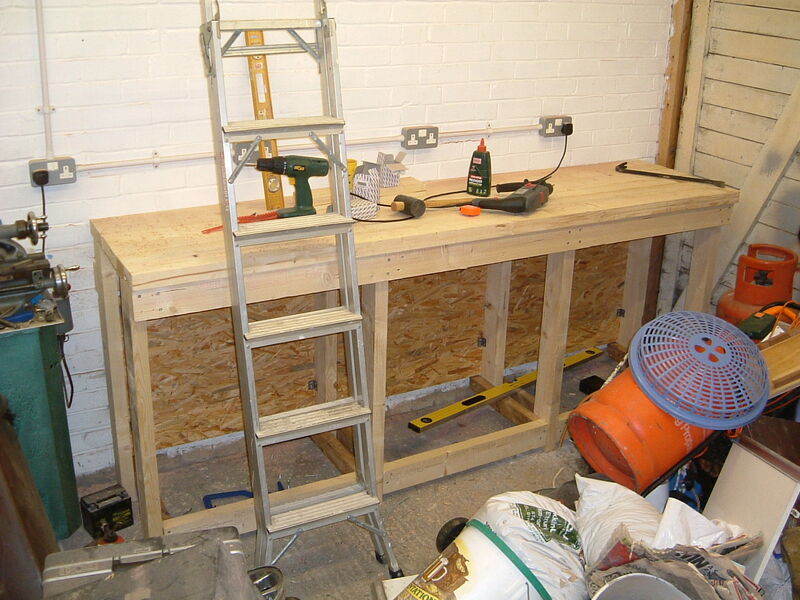 The washing machine and tumble drier sit here, I wanted a "dirty bench" here - grinding, punching, hammering, pressing - all the heavy duty or unclean jobs can then be confined to one bench. 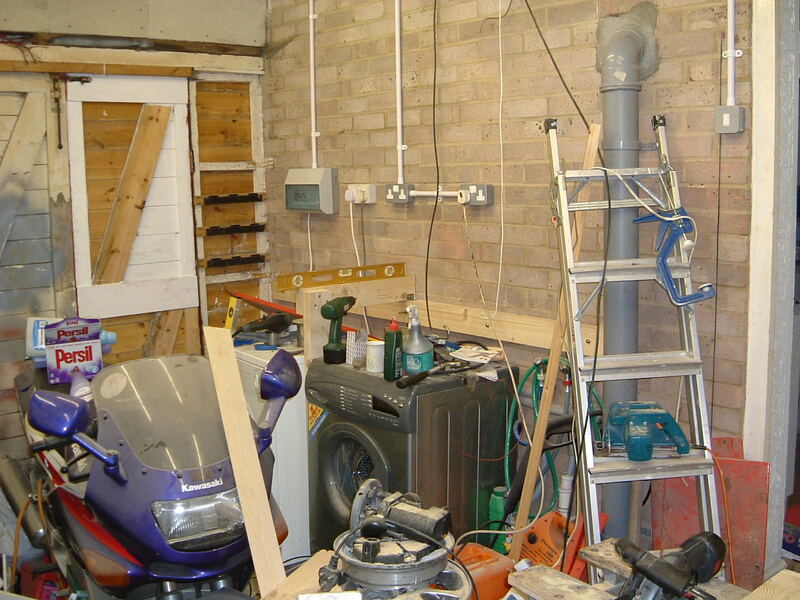 13-Sep-2003: The flimsy sheet of contiboard over the washing machine and drier has been removed. Another wall plate just to hang everything on to. 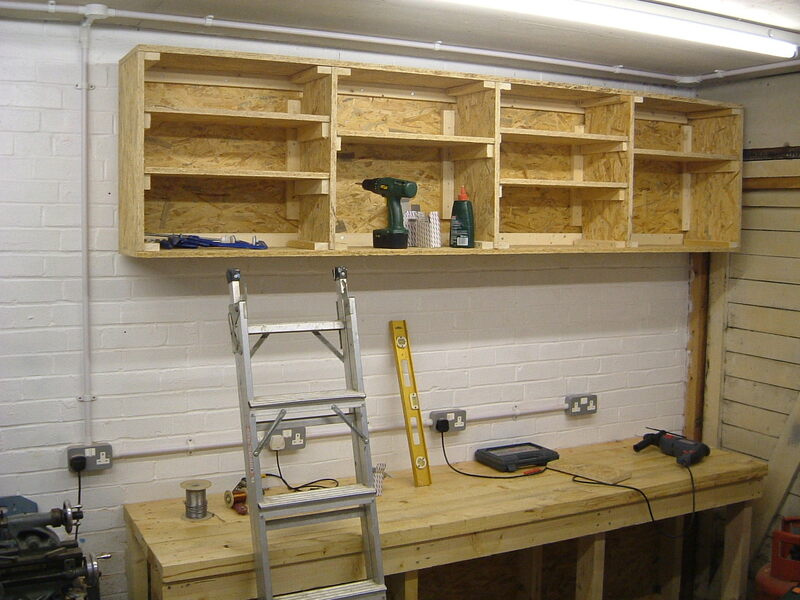 14-Sep-2003: Bench is done, a board has been bolted to the wall to build the cupboard around. 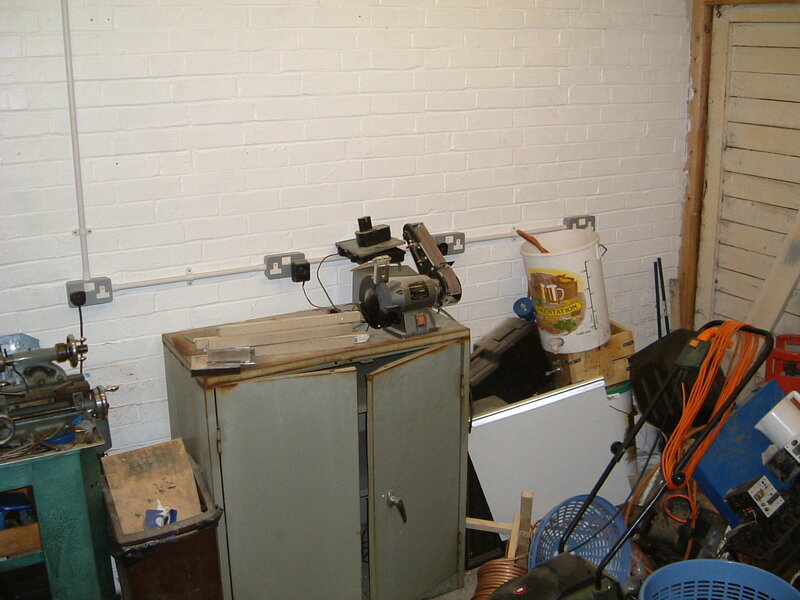 The lathe sits on the right wall, but there is room for another 8 foot long bench and some cupboards. 02-Nov-2003: Another mess that needs a magic wand waved over it... 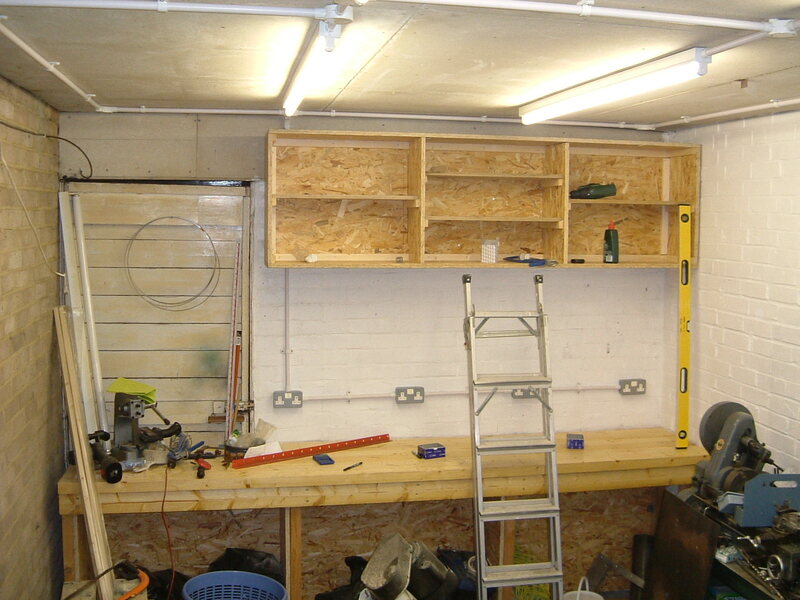 The metal cabinet is going, the contents of it are now stored in the cupboards under the bench on the end wall. 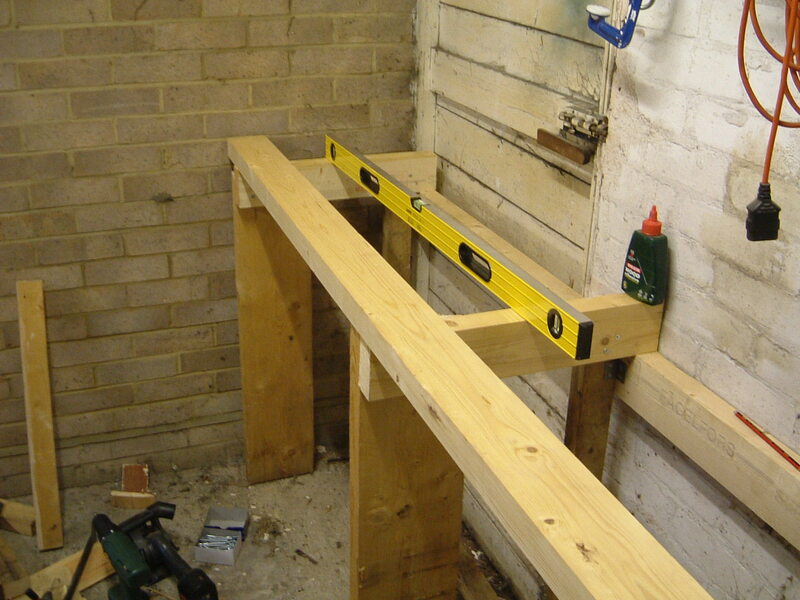 08-Nov-2003: Bench is now in, although the interior still needs to be fitted out. 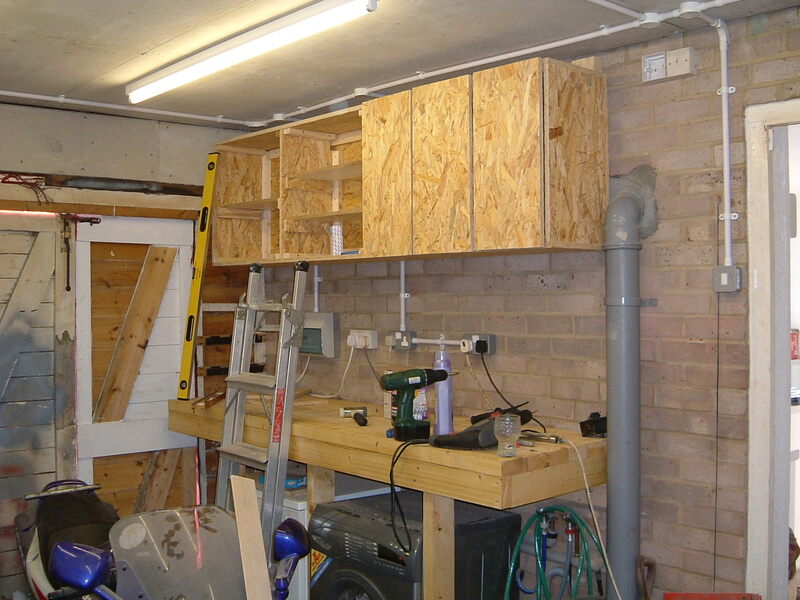 09-Nov-2003: Some progress with the cupboards too.